Have questions about LayerZero Power Systems? Find your answers here. What currents are LayerZero Static Transfer Switches available in? We offer Static Transfer Switches with 150 A, 250 A, 400 A, 600 A, 800 A, 1200 A, 1600 A, 2000 A, 3000 A, and 4000 A. What is the difference between an ATS (Automatic Transfer Switch) and STS (Static Transfer Switch)? A Static Transfer Switch (STS) utilizes a static electronic component (SCR), which permits a transfer in less than four milliseconds (1/4 of an electrical cycle). LayerZero Static Transfer Switches (eSTS) utilize Dynamic Phase Compensation technology, which delays the transfer until the perfect moment, compensating for out-of-phase sources. On the other hand, an Automatic Transfer Switch (ATS) relies on moving parts, and makes a significantly slower transfer than Static Transfer Switches. Will you customize your products to fit our specific needs? Yes! All LayerZero products have various options that can be custom-configured. We will be happy to work with you to determine and customize the best LayerZero solution for your needs. Does LayerZero equipment require top or bottom installation? LayerZero eSTS Static Transfer Switches, ePODs Power Distribution Units, and ePanel Wall-Mounted Power Panels, support both top and bottom cable installations. LayerZero eRPP Power Panels support bottom cable installation, side access is not required for installation, operation, and maintenance. What connectivity protocols are available on LayerZero Static Transfer Switches? Connectivity to LayerZero eSTS Static Transfer Switches utilizes Ethernet and hardwired (dry contacts) connections. Ethernet connectivity options include http, Modbus/TCP, and SNMP. Hardwired connectivity includes summary alarms, on Source 1, on Source 2, Source 1 available, and Source 2 available. What connectivity protocols are available on LayerZero Remote Power Panels? Connectivity to LayerZero eRPP and ePanel Power Panels utilize Ethernet, hardwired (dry contacts), and Bluetooth connections. Ethernet connectivity includes http, Modbus/TCP, and SNMP. Hardwired connectivity includes a summary alarm. Bluetooth connectivity is utilized for panel setup. What modbus registers can be accessed? All Modbus/TCP registers can be accessed. Please contact LayerZero Support for a Modbus registry list. Does LayerZero equipment support Modbus RTU? LayerZero products support Modbus TCP. We can recommend conversion tools available to help bridge the two protocols if you require Modbus RTU connectivity. Can you set time via network? Yes, time is synchronized utilizing Network Time Protocol (NTP). The LAN location (IP, netmask, gateway ID) of the NTP server is defined at the eSTS at start-up. Thereafter, the eSTS fetches its time from the NTP server and stays synchronized. What does the name LayerZero mean? 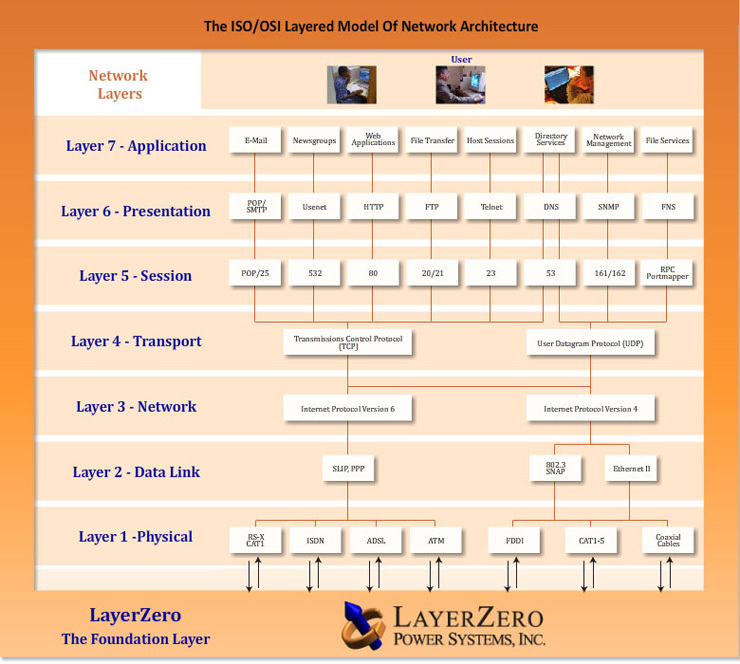 The name "LayerZero" was created on the idea of creating a robust foundation layer of power system infrastructure for data centers. Founded in 2001, and the LayerZero name was inspired by the need for high-reliability foundation-level power distribution systems designed specifically for mission-critical facilities. The Open System Interconnection (OSI) reference model refers to seven layers (Layers 1-7), each specifying a particular network function. The model was developed by the International Organization for Standardization (ISO), and it is now considered the primary architectural model for intercomputer communications. "Layer Zero" of the ISO/OSI reference model needs to be comprised of reliable, safe, information centric and a highly connected set of power distribution products and processes. LayerZero is the foundation. For more information about the background of the LayerZero name, please visit the page "What is LayerZero". What does the LayerZero Power Systems logo mean? The LayerZero logo is a graphical representation of the "Right Hand Rule". LayerZero Power Systems products are designed for operations that require uninterrupted critical power, including data centers, cloud computing, banking, insurance, and medical industries. One of the main concerns is of data centers is maintaining business continuity; business rely on information systems to run their operations. If a system becomes unavailable, operations may be impaired or stopped completely, often causing serious disruptions to a company's operations, as well as their reputation. It is necessary to provide a reliable power infrastructure for IT operations, in order to minimize any chance of downtime. A Static Transfer Switch is designed to get you out of trouble - fast. LayerZero provides a last-line of defence in the event of a potential incident, reliably switching power between multiple sources and safely distributing critical loads. For a sample list of industries served, please visit the "Customer Base" page. Why do all LayerZero products start with the letter "e"? The "e" in LayerZero stands for "web-enabled", and products beginning with the letter "e" (eSTS, ePODs, eRPP, and ePanel) are "web-enabled". All LayerZero products beginning with an "e" have built-in web servers, enabling data center professionals with the ability to remotely log into and collect information from LayerZero products using a standard web browser. 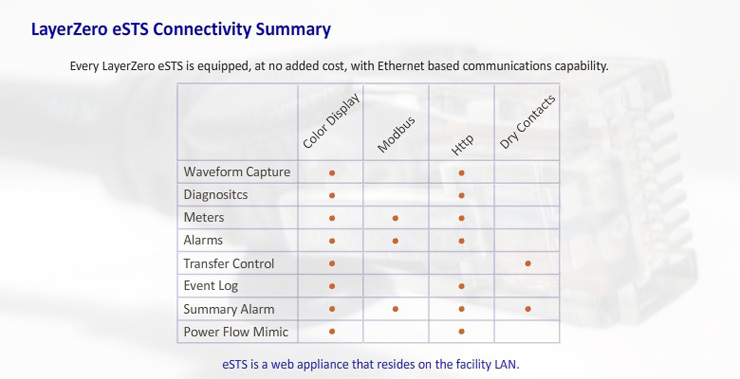 eSTS is an acronym for Web-Enabled Static Transfer Switch. A Static Transfer Switch is a devices that switches between multiple sources fast. When incorporated into power distribution systems, Static Transfer Switches increase system reliability. ePOD is an acronym for Web-Enabled Power Distribution Unit. A Power Distribution Unit is a device that destributes electrical power, often containing a transformer and/or Static Transfer Switch. 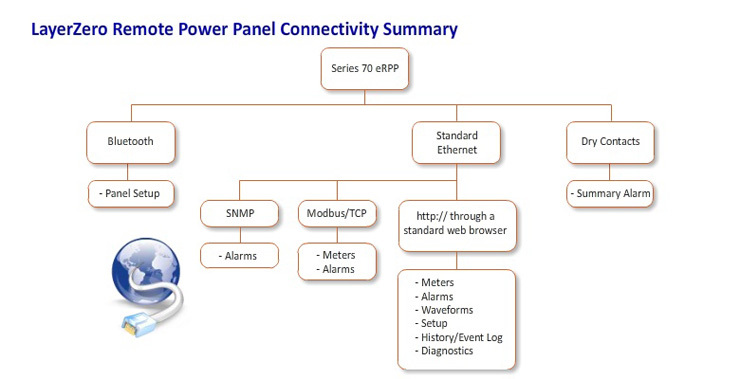 eRPP is an acronym for Web-Enabled Remote Power Panel. A Remote Power Panel is a device that distributes electrical power. ePanel is the name for LayerZero's Web-Enabled Wall-Mounted Panel Board. ePanels consist of finger-safe panel boards, with optional main breakers. What does "Series 70" mean? The "Series 70" product line was inspired by the need for low-voltage critical power distribution products with an emphasis on maximizing operator safety. The "70" in Series 70 stands for section 70E of NFPA, the guideline for electrical safety. With the introduction of the SafePanel in 2007, LayerZero coined the term "Series 70" for our safety-focused upgrade to our product line. Other features that signify a "Series 70" product include InSight™ IR Portholes, front-only bolted connections, and insulated buswork. All LayerZero "Series 70" products are "NFPA-70E Friendly", specifically designed to be safe to operate. The SafePanel is a finger-safe panel board designed by LayerZero. Available in 400 A and 1200 A, the SafePanel requires IP-20 PPE. Type-P is a configuration of Power Distribution Units that LayerZero manufactures. The "P" stands for "Primary-Side", the location of the Static Switch on a ePODs: Type-P. From left-to-right, the ePODs Type-P contains a Static Transfer Switch, Transformer, and Distribution. What is a Dual Type-P? Dual Type-P is a configuration of Power Distribution Units that LayerZero manufactures. The "P" stands for "Primary-Side", the location of the Static Switch on a ePODs: Dual Type-P, and "Dual" signifies "Two Transformers". From left-to-right, the ePODs Type-P contains a Static Transfer Switch, Two Transformers, and Distribution. Type-S is a configuration of Power Distribution Units that LayerZero manufactures. The "S" stands for "Secondary-Side", the location of the Static Switch on a ePODs: Type-S. From left-to-right, the ePODs Type-S contains a Two Transformers, a Static Transfer Switch, and Distribution. Type-N is a configuration of Power Distribution Units that LayerZero manufactures. The "N" stands for "No-Transformer". From left-to-right, the ePODs Type-N contains a Static Transfer Switch and Distribution. Type-X is a configuration of Power Distribution Units that LayerZero manufactures. The "X" stands for "No Static Transfer Switch". From left-to-right, the ePODs Type-X contains Distribution, a Transformer, and Distribution. Distribution cabinets on both sides is optional, our products can be custom-configured to best-fit your needs.